We've made some good progress on our chassis, but we'll cover that later. It's time we talk paint. 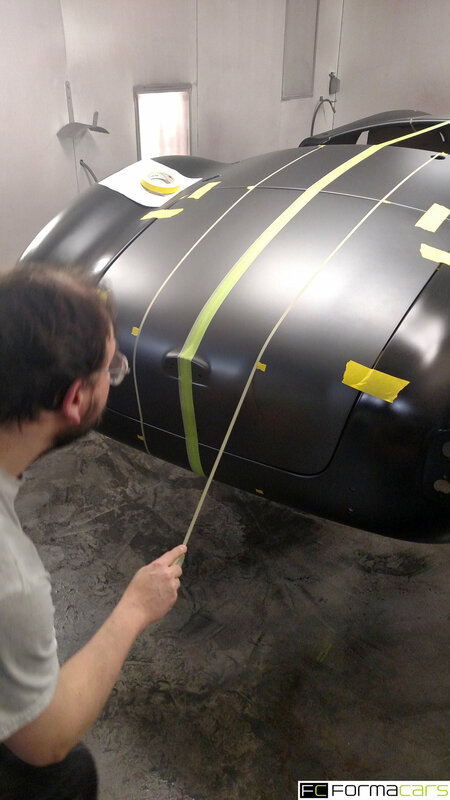 A few weeks ago we had our body man paint a test panel. 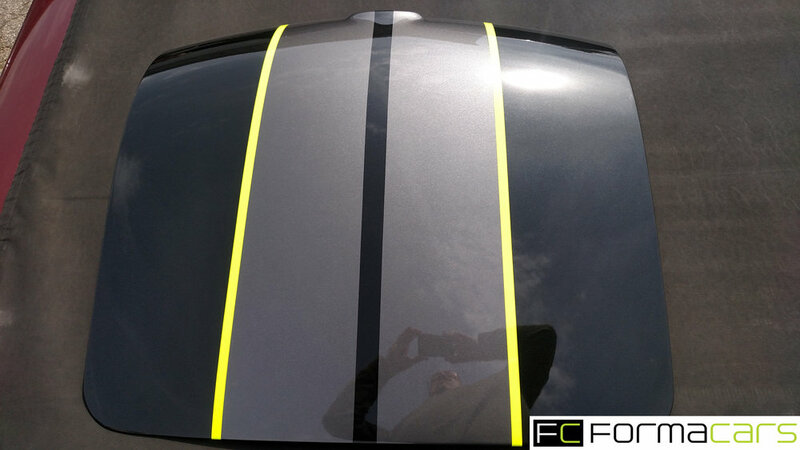 We had decided on a medium gray metallic base with black stripes outlined by our signature neon yellow/green. 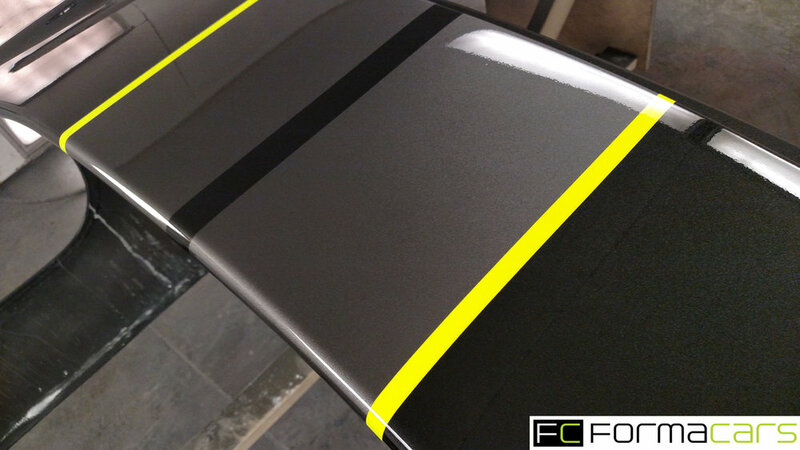 We wanted to play with the black - metallic or not, matte or gloss - as well as wide or narrow neon. 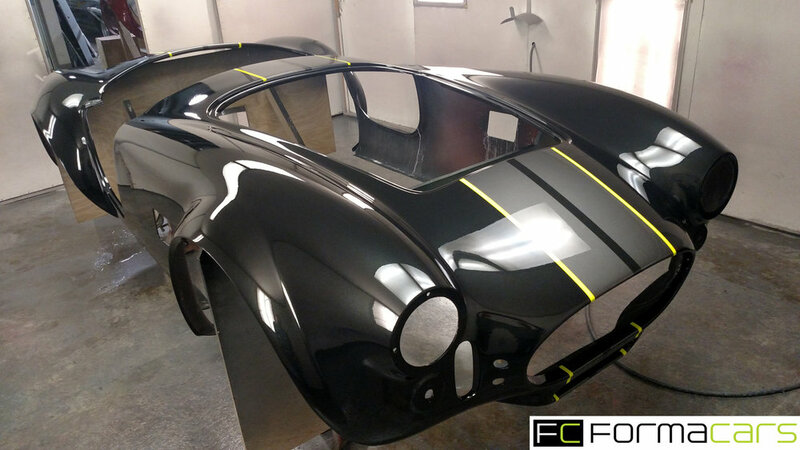 In the end we decided metallic on the black, wide on the neon and all gloss. We also decided to eliminate the gap between the neon and the main body color. 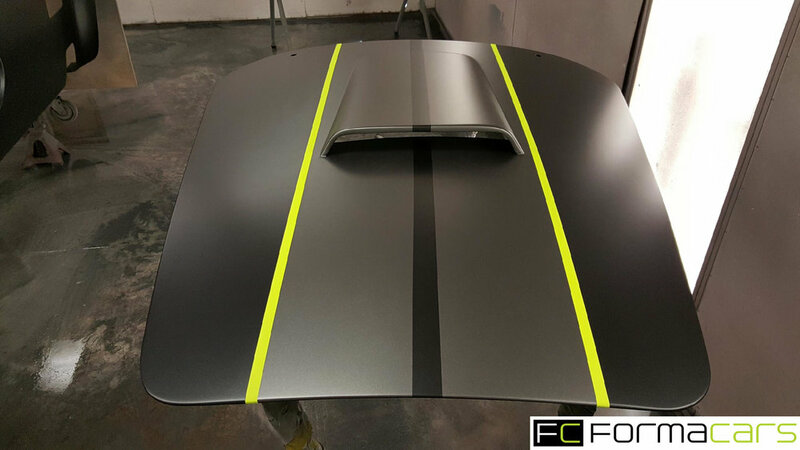 Then at the last minute we flipped the script and decided to go with a metallic black base (called "Carbon Flash") with the medium gray stripes. 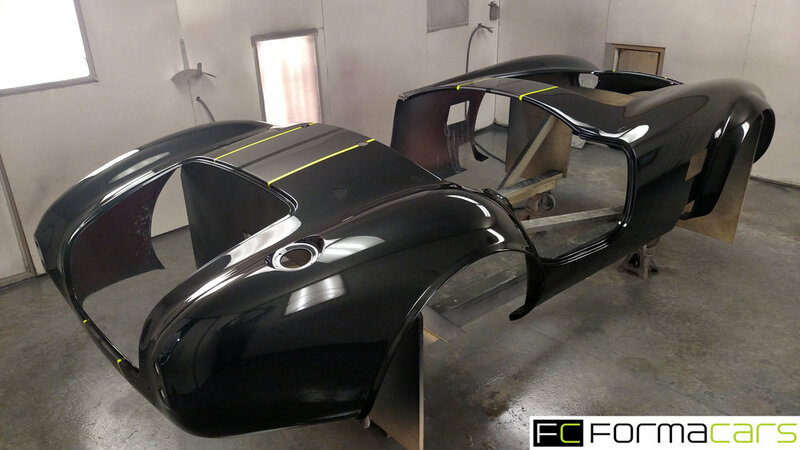 Once the body was back in his shop, our body man laid down the gray for the stripes and we went over to work with him on laying them out. Taping them off following the prefered tapered dims is tedious work to get right, but moving tape is a whole lot easier than moving paint. A bit shocking, isn't it? It's the kind of color you need to use sparingly. Now we're getting somewhere. Even without the clear it's starting to look real good. About a week later, we got the chance to see it with the clear and we couldn't be more pleased. 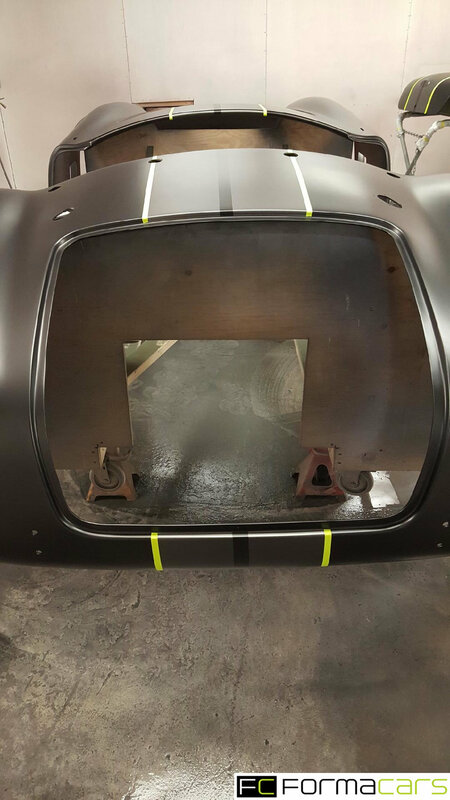 The first shot of the decklid is out in the sun, the others are taken inside his shop. This week our body man is on vacation while the clear sets up. Next week the wet sanding and finishing and at the end of that week the body will come back here. We hope to be go carting by then, but that's perhaps a bit ambitious. You can see also the way the scoop is blended with the body. 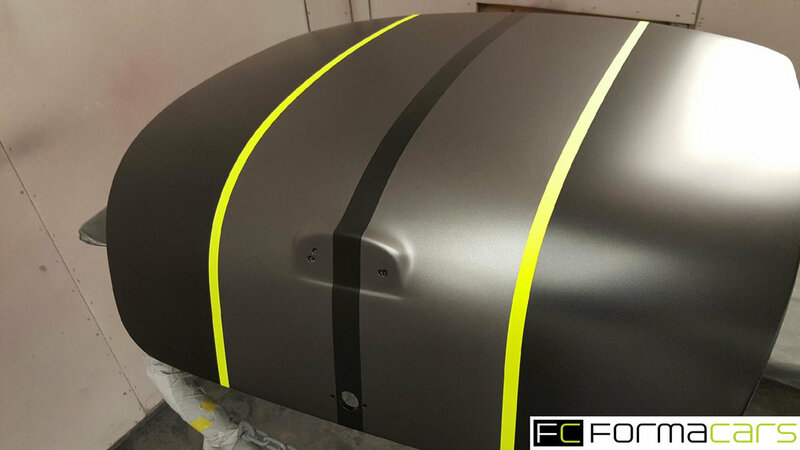 He did a fantastic job of getting a nice crisp radius, plus notching the front so that the hood surface extends well inside the scoop.